I is the 9th letter of English alphabet. 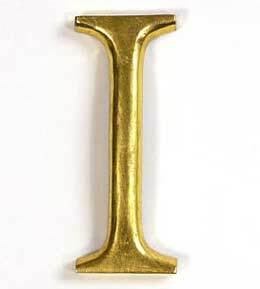 I represents law.People who have their names starting from Alphabet "I" are gifted with ability to express feelings and thoughts / constructive thinking / Ability to judge and attract others. Accumulation of money is only aim for many people with name starting from Alphabet "I". They are impulsive in nature and they work quicker than others. I is genteel, impulsive, elegant and has warmth of heart. I is an inspirational letter. I as the first vowel in a name describes a person who is interested in the arts, science and drama. A negative I can be timid, nervous and quick to become angry, or fearful. When coming from the negative aspect of their nature, I’s are easily offended.